Who do you think you are? The phrase, inseparable in the minds of Canadian readers from Alice Munro’s book of that title, has arisen in a number of discussions with fellow writers over the years, referring specifically to the reluctance – in these conversations posited as particularly Canadian and, though perhaps secondarily, particularly female – to pronounce a viewpoint. 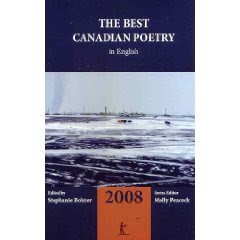 It appeared in a thought bubble over my head when I received an e-mail from Halli Villegas early in 2007, asking if I would edit the first annual The Best Canadian Poetry in English. The invitation came as a surprise, an honour, and a privilege, one that I hesitated to accept not because of the inevitable time-drain, but because of the responsibility. Canadian English language poetry is a dynamic art, and those literary journals that publish poetry reshape the landscape of Canadian letters every year. Yet few of us, even the most avid poetry-trackers, peruse all these magazines, and many of us are bewildered by their abundance. This is the primary reason for our yearly series. Our annual pulse-taking will track the birth of ideas, language, and rhythms of culture across the English Canadian poetic landscape. As well, it will highlight the emergence of new voices and the renaissance of familiar voices. From sound poems to confessional poems, from loose-limbed narratives to formal verse, from bellows to whispers, from the avenues to the bush, from west to east and all directions in between, prosodic decisions, geographical propensities and cultural proclivities give Canadian poetry its astonishing variety. The Best Canadian Poetry in English addresses both the confusion and the plethora by narrowing the field, providing a kind of qualifying finals for poetry every year. The back of the collection includes has a list (with contact information) of the thirty-four Canadian print journals consulted for this collection, including The Antigonish Review, The Capilano Review, dANDelion magazine, Descant, The Fiddlehead, filling Station, Kiss Machine, The New Quarterly, Prairie Fire, QWERTY and Taddle Creek. One of the things I always wondered, if Canada had its own version of this series, is if the series would allow some of our less “mainstream” writers to edit a volume; I know one of the American editions was edited by Robert Creeley, and I’ve wondered out loud if a Canadian one would ever let our Creeley-equivalents, say, perhaps, George Bowering, Robin Blaser or Fred Wah, for example, even near such a thing. One of the American editions even included works by Erin Mouré, Steve McCaffery and Anne Carson; would such be allowed near a Canadian volume (keeping in mind, they would have to be publishing in Canadian journals that year to be considered)? I do like the book’s range, and there are some compelling pieces by some I wouldn’t have expected to see in such a book, including Dani Couture and Jeramy Dodds, and impressive pieces by old favourites John Barton, Susan Elmslie, Peter Norman, Shane Rhodes, Aurian Haller, Meira Cook and plenty of others. But still. Is my bias showing again? Is this simply a bias of Canadian publishing, something the creators of the current volume couldn’t have worked against or foreseen? Were the so-called “avant-garde” poets simply not publishing this past year? I cannot love you all and I won’t. a crowd. The clam-soft give. The crack of the shell. wave your lunch bone arms. in the tunnels, forts at every junction. pale while stalks, tender volva. Pick one. Another. There are other ways home. what you can afford to leave behind. Impress me with your stones, your height. The sweet dip of your neck. Part of what, at least, the American series achieves is not just an attempt at a cross-section of writing from journals across the country over the past year (finding the imagined “best,” if there is such a thing), but works to showcase that year’s American poetry to a foreign audience. This is something that Canadian writing has never quite managed to push out in the same way, given the lack of large Canadian publishers willing to produce anthologies of Canadian contemporary poetry for the sake of the foreign markets. If we don’t tell them how great we are, how will we ever know? Somehow, knowledge of Canadian poetry in the United States, for example, happens piecemeal, whether Sina Queyras producing an anthology of Canadian poetry coming out of her involvement in a reading series in New York City, the Canadian poets that have made it through SUNY-Buffalo as faculty, students or just passing through, the Lisa Robertson section in a recent issue of The Chicago Review, or other fits and starts that really don’t help to give anything much more than a taste. Is Tightrope a publisher large enough, or even interested in, pushing Canadian writing across geographic borders? Is it a publisher that should even be trying? into the yielding forest, which shrugged when we tried to praise. aimed its whole self down to the centre of the earth. and moss disorder, the water inscribed edge without movement. an imitating eye, and the mirror elegy to what it loved. of glimpsing, the second time, what we always first ignore. But that’s neither here nor there. This is an impressive beginning to what, hopefully, can be an interesting series. The hard part won’t be in an editor selecting pieces, but in the publishers and Series Editor, Molly Peacock, picking guest editors that reflect the range of Canadian writing, and don’t simply perpetuate Canadian writings leanings away from more radical forms of writing. But time will only tell. Rumours have it that the next editor, for 2009, is already picked: A.F. Moritz.